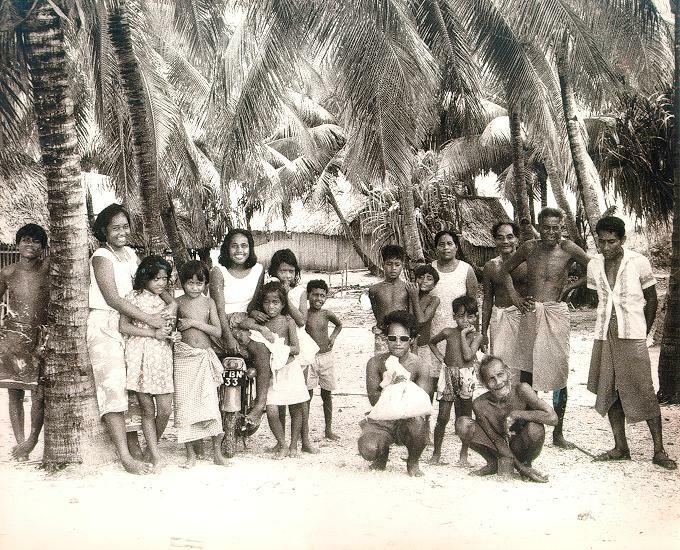 The goal of this lesson is to acquaint you with the greetings in use in Kiribati today, and when it is appropriate to use them. By the end of the lesson you should be able to greet someone in a variety of situations, and give appropriate responses. Tim: Ko na mauri ! Jim: Hello! Tiaon: Mauri ! John: Hello! Tim: Ko uara? Jim: How are you? Tiaon: Ko rab'a, I marurung. Ao ngkoe, ko uara? John: Thank you, I'm fine. And you, how are you? Tim: I marurungi naba, ko rab'a. Jim: I'm fine also, thank you. Memorize both roles of the dialogue. Practice initiating the sequence and responding to someone else's offered greetings, reversing roles periodically. Unlike the English greeting "hello," ko na mauri is generally used only for a first meeting, or after some time has passed since the greeters have last met. It is often abbreviated to a simple Mauri! Ko na aera? Where are you going? Ko na nakea? Where are you going? Ko na toki iia? Where will you stop? Ko na boo nakea? Where are you going? Ko nako maiia? Where are you coming from? Ko a oki? You're returning? Ko boo maiia? Where are you coming from? Using the additional vocabulary items listed in the next section, create new dialogues appropriate to different times of day. Vary your role to be initiator and responder. Change these dialogues into ones appropriate for situations where it is not the first meeting of the day. Take a walk through the community, trying out appropriate greetings on the people you meet. Make note of their responses, and report any new additions to your greeting repertoire. For example: Ko uara n te bong aei? For example: I aki rangi ni marurung. Or: A: Ko uara? B: Teutana. Ko is the singular form of the second person pronoun, in the form used before a verb. When more than one person is being addressed, the plural form kam is used: Kam na mauri! Ngkoe is also a pronoun standing for "you", but is used in places other than before a verb, such as for a one word answer to a question.